The Dark Ranger: One-Two-Three-Four Punch! One-two-three-four points, that is. The team that made Mr. Avery a multi-millionaire were reminded last night of why they originally awarded him the $3+ million per year contract last season before trading him back to New York and willing to pay for half the contract, as our resident agitator decided to show-up and give The Garden a taste again of what we've come to expect from the 'Most Hated Player in the NHL'. I can only affectionately describe the guy as the following: A gnat (see Brendan Morrow). A bully (12 penalty minutes last night). A good hockey player (1 goal, 3 assists). He is certainly worth the $1.9 million for the next couple of seasons. 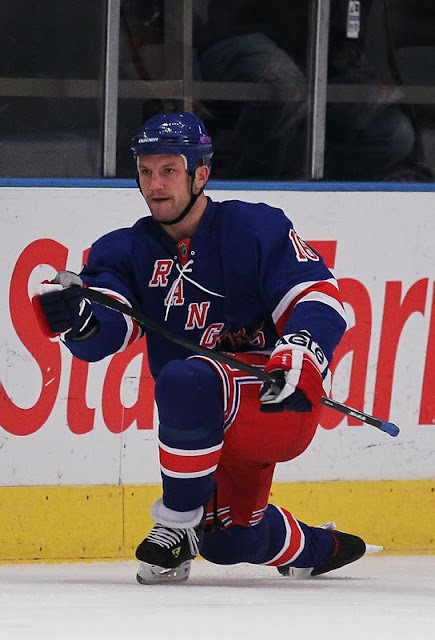 Keep the heat up on the ice, Sean -- because we embrace it when you take off the Torts-shackles and show a little 'First Blood' (and for God's sakes --- tell your PR guy to stop with the Sean Avery bar updates -- we don't care). Just play good hockey and we'll all be happy fans. "I would have loved to have seen that delinquent do that for us last year, I didn't think four points was possible. He has a good shot and he always has worked hard. His intelligence on the ice has always been an issue, and was with us when he was here." "It is a pretty good night when you have four points against a team that didn't want you a year ago,"
"There has been no leash or handcuffs on Sean Avery. We have really tried to push him the past couple of months in trying to get his game back and to play this way. I want Sean Avery on edge ... when he crosses the line, it is my job to try to bring him back." TDR footnote: I wonder if he actually believes his own soundbite -- this is contrary to his actions as a coach all season, so this statement makes him look stupid if you ask me. Oh yeah, and that Marion Gaborik guy is pretty good too. Right...he currently leads the NHL in goals. Nice to have you on board Oh-Great-Not-Hurt-One. So our Blueshirts sit in the 7th slot in the Eastern Conference as of today with a record of 21-17-5. It appears we're coming out of the slump, but the reviled and surprising Atlanta Thrashers are next on our card tonight --- they always seem to beat us since we thrashed them during the playoffs seasons ago, so perhaps a bit of this mojo will carry into the chilly deep south where hockey was historically never envisioned. 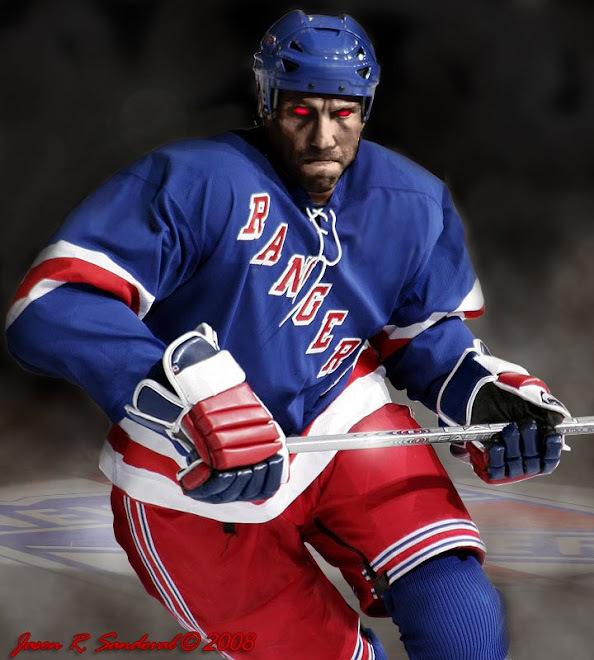 Let's Go Rangers and keep the faith Blueshirt Brethren! P.S. if anyone watched the live broadcast, you might have caught Joe M. on MSG make the following statement while referring to Marty Turco's assist after the first goal, "You know, Sam....Turco is one of the finest passers in the game." Too bad nobody told Joe that Turco was the Stars' goalie. Oops.